A pant-type underwear article (10), comprising a front (12), back (14), crotch (16) and waist (18) regions, said article (10) having a longitudinal (y) and a transverse direction (x). According to the invention, at least part of the article (10) comprises an elastic laminate (20) composed of first (22) and second (24) layers of fibrous material and an elastic film layer (26) located between said first and second fibrous layers (22, 24), said elastic laminate (20) having a puncture resistance of at least (15N). Background of the invention It is known to hold disposable absorbent bodies in place against the body of an incontinent wearer with reusable pant-type underwear articles. The disposable absorbent bodies may be sanitary napkins or incontinence articles. This approach has advantages over conventional absorbent articles with an integral absorbent core such as diapers or incontinence pants, in that only the absorbent component of the article is disposed after soiling, while the underwear component can be reused, thus providing savings in both manufacturing costs and materials. Elastic materials, such as stretch-bonded laminates, are also known. Such laminates may include a layer of meltblown elastomeric fibers which have been stretched and sandwiched between outer layers of spunbonded webs. US2003/0022582 describes a laminate in which an elastomeric film is bound between two or more layers of nonwoven webs. The laminate is said to be particularly useful in elastic "ears" of diapers, which allow the diaper to be stretched to accommodate variously sized wearers. It is stated that nonwoven materials provide little or no puncture resistance, hence any puncture resistance which the laminate has will be almost exclusively due to the puncture resistance of the elastomeric film. However, there is room for improvement of the underwear articles used in two- component systems. The consumer places high demands on the comfort, fit and cloth-like feel of the pant-type underwear articles. Discreteness of the article is also a high priority, so the underwear article should be thin, preferably equally as thin as a pair of ordinary cotton pants. Furthermore, it is highly desirable that the absorbent body is held correctly in position against the wearer's body by the underwear article, so that it is optimally positioned to receive body exudates and undesired slippage or movement of the absorbent body is avoided. The underwear article itself is intended to be re-used, and therefore requires washing. It must therefore be able to tolerate the elevated temperatures, water, detergents and mechanical agitation which are present in the washing and/or drying machines of today without breaking. There is therefore a need for improvement of the strength of underwear articles, particularly their resistance to puncture. One object of the present invention is to provide a pant-type underwear article which combines the properties of comfort and fit to the wearer's body and a soft and cloth- like feeling close to textile materials. It is further desirable that the article can be put on and taken off without puncturing, e.g. by fingernails. This is an important feature, as the force which can be applied during putting on and taking off such an article has been estimated as being up to 5IM. It is also an object of the invention that the article should tolerate machine washing and drying and remain intact. These and further objects according to the invention have been accomplished by a pant-type underwear article comprising front, back, crotch and waist regions, at least part of said article comprising an elastic laminate composed of first and second layers of fibrous material and an elastic film layer located between said first and second fibrous layers. According to the invention, the elastic laminate has a puncture resistance of at least 15N. Due to the materials and methods involved in its construction, the puncture resistance of this laminate is higher than the elastic film layer alone (i.e. the layers of fibrous material contribute to the puncture resistance of the laminate). The underwear article provides good fit due to the elasticity of the laminate, and a cloth-like feel. Furthermore, the underwear article is reusable, and tolerates machine washing/drying, even machine washing up to 600C. Use of the laminate allows the article to survive machine washing at least three times at up to 6O0C through a washing cycle of a washing machine and yet remain intact. The underwear article may be used to hold individual absorbent bodies (e.g. sanitary napkins or incontinence articles) securely in place against the user's body, yet will not be permanently fastened to such absorbent bodies. The elastic properties of the laminate help to ensure that the absorbent bodies are held securely against the wearer's body. Preferably the elastic laminate has a puncture resistance of at least 2ON, more preferably at least 3ON. In one embodiment, the elastic laminate has an elasticity in the transverse direction of the article of at least 30%, preferably at least 50%, more preferably 70%, when measured according to the elasticity test specified herein. Elasticity in the transverse direction of the article allows an article of a single size to be used on wearers having a variety of waist sizes. At least one of the layers of fibrous material may have an elongation at maximum load greater than the elasticity of the elastic laminate. Furthermore, both layers of fibrous material may have an elongation at maximum load greater than the elasticity of the elastic laminate. According to one embodiment of the present invention, the layers of fibrous material have an elongation at maximum load of at least 10%, preferably at least 20% greater than the elasticity of the elastic laminate. The first and/or the second layers of fibrous material preferably comprise a mixture of polypropylene and polyethylene polymers. Description of the Figures Fig. 1 shows a perspective view of a pant-type underwear article. Fig. 3 is a cross section through an elastic laminate according to the invention. Fig. 5 is a graph showing load vs. strain for two nonwoven fibrous layers. Fig. 6 is a graph showing load vs. strain for an elastic laminate. The invention will in the following be closer described with reference to some embodiments shown in the accompanying figures. The article is thus divided into four regions (front region 12, back region 14, crotch region 16 and waist region 18) in its longitudinal direction, as shown in Figure 2. The front region is defined by the edge of the article at which the waist region ends, the longitudinal side edges of the article, part of the leg openings of the article and a transverse line (a) which is located at the point at which the angle of the edge of the leg opening changes most abruptly (i.e. the point at which the rate of change of the angle of the edge of the leg opening with respect to the transverse direction is highest). The back region is defined in a similar manner: by the edge of the article at which the waist region ends, the longitudinal side edges of the article, part of the leg openings of the article and a transverse line (b) which is located at the point on the edge of the leg opening at which the angle of the edge changes most abruptly (i.e. the point at which the rate of change of the angle of the edge of the leg opening with respect to the transverse direction is highest). The crotch region is defined at its longitudinal edges by the edges of the leg openings of the article and at its transverse edges by the two transverse lines (a) and (b) described above. At least part of the article 10 comprises an elastic laminate 20 composed of first 22 and second 24 layers of fibrous material and an elastic film layer 26 located between said first and second fibrous layers 22; 24. Characteristically, the elastic laminate 20 has a puncture resistance of at least 15N. Preferably, the elastic laminate 20 has a puncture resistance of at least 2ON, more preferably at least 3ON. In contrast to the method described in WO 03/047488, upon manufacture of a laminate according to the present invention, at least one, preferably both fibrous layers which are bound to the elastic film are not completely torn. Selection of fibrous materials which have an elongation at maximum load greater than the elasticity of the elastic laminate allows the elastic film to stretch without being hindered by the fibrous layers. Such a selection also ensures that the fibrous layers contribute to the puncture resistance of the laminate, as they are not completely torn or broken during manufacture. Therefore, at least one of - alternatively both - the layers of fibrous material 22, 24 may have an elongation at maximum load greater than the elasticity of the elastic laminate 20. Preferably the layers of fibrous material 22; 24, or at least one of the fibrous layers, have an elongation at maximum load that is at least 10%, preferably at least 20%, greater than the elasticity of the laminate 20. According to a most-preferred embodiment of the invention, the elastic laminate 20 comprises first and second fibrous layers 22, 24 of spunbond material, each having a basis weight of between 10 and 35 g/m2, preferably between 12 and 30 g/m2, more preferably between 15 and 25 g/m2 and a breathable elastic film layer 26 having a basis weight between 20 and 100 g/m2, preferably between 20 and 60 g/m2. The elastic laminate 20 according to this embodiment has a Water Vapour Transmission Rate according to ASTM E96-00 Procedure D of at least 1500 g/m2 24h, preferably at least 3000 g/m2 24h. Fig. 5 shows the behaviour of two 20gsm and 25gsm nonwoven layers (BBA Sofspan 200) under stretching. It can be seen that, with increasing load (in Newtons), the strain in the layer increases, first slowly and then more rapidly. The applied load eventually reaches a maximum (the "maximum load"), at which point the load drops rapidly as the material fails. It can be seen that for the 20gsm layer, maximum load is reached at around 90% strain, while for the 25gsm layer, maximum load is reached at around 150% strain. BBA on both sides of a 40 gsm apertured elastic film, where one face is glue-laminated with approximately 5 gsm glue. From zero strain, the laminate exhibits elastic behaviour in region (A) up to around a "knee point" (B), after which, the load increases rapidly through region (C). The knee point (B) is defined as the first point on the load-strain curve at which the gradient becomes greater than 0.3N/%. The laminate shown is elastic up to about 80% strain - as this is less than the elongation (strain) at maximum load of the nonwoven layer (ca. 150% from Fig. 5), the laminate falls within the present invention. The applied load eventually reaches a maximum (the "maximum load", D), at which point the gradient of the load-strain curve is zero. The load then drops through region (E) as the material fails. Complete failure of the laminate occurs at point (F). The opacity of a material layer is the characteristic ability of the material layer to visually hide from view an underlying object or pattern. The opacity is measured in %, wherein 100% opacity means that nothing can be seen through the material layer and 0% means that the material layer is completely transparent. The opacity is measured by the Opacity Test described below, which is based on luminous-reflectance-factor data. The elastic web material has an opacity of at least 40%, preferably at least 50% and more preferably at least 60%. The opacity of the elastic web material provides a cloth-like appearance to the article, which is of particular importance when the article is pant-type underwear. Especially in this case, where the elastic web material forms the sole component in large areas of the front and back regions, the appearance of the elastic web material is of great importance for the overall appearance of the article. Thus by making the elastic web material opaque with an opacity of at least 40%, the pant-type underwear article will appear more cloth-like and more like "normal" underwear, than if the elastic web material has a higher degree of transparency. The entire article 10 may comprise elastic laminate 20. Preferably, at least the front region 12 of the article 10 comprises the elastic. laminate 20. Furthermore, both the front and back regions 12; 14 of the article may comprise the elastic laminate 20. According to a preferred embodiment a substantial part of the crotch region 16 of the article is free from the elastic laminate 20. A "substantial part" used herein refers to at least 50%, preferably at least 75%. If the crotch region 16 does not comprise elastic laminate 20, it may comprise nonwoven material, or a breathable film material. This embodiment allows improved comfort and breathability of the article in the crotch region. Alternatively, the crotch region 16 may comprise a different nonwoven film laminate than the elastic laminate 20 used in the remainder of the article. As a further alternative, the crotch region 16 may comprise a plastic film material, which may be non-breathable. Preferably also the waist region 18 of the article is free from the elastic laminate. The waist region 18 may comprise a nonwoven material that is elasticized by elastic members 30, such as elastic threads, contractably affixed between material layers, such as nonwoven materials. Such elastic members 30 may also be arranged around the leg openings of the article. Ultrasonic welds, glue strings or the like, join the elastic laminate 20 to the elasticized nonwoven in the waist region 18. No additional elasticized side panels joining the front and back regions 12 and 14 are needed when using the elastic laminate 20 according to the invention. If desired, additional elasticized side panels may of course be provided, especially in cases where the elastic laminate 20 is arranged only in parts of the front and/or back regions. The elastic laminate should have a puncture resistance of at least 15N as measured according to ASTM Designation D3763-02. Preferably, the elastic laminate of the present invention has a puncture resistance of at least 2ON, and more preferably at least 3ON. The opacity of the elastic web material is measured according to a slightly modified version of SS-ISO 2471: 1998 by the Swedish Standard Institute (Diffuse Reflectance Method). The method is originally intended for measuring the opacity for paper sheets, but it also functions well for measuring the opacity of other types of sheet materials, such as elastic laminates according to this invention. The opacity is measured in an unstretched condition of the elastic web material. The principle of the test method is to measure the Single-Sheet Luminous Reflectance Factor, R0, through a single sheet against a standardized black backing and the Intrinsic Luminous Reflectance Factor, R00, against a completely opaque white backing. The opacity (%) is calculated from the formula 100- R0/ R∞. The following modifications of the test method were made: i) When measuring the Single-Sheet Luminous Reflectance Factor, R0, a black velvet fabric was used as backing. ii) When measuring the Intrinsic Luminous Reflectance Factor, R∞, the measurement was made on one single sheet of the elastic laminate against a white tile as backing. iii) The CIE illuminant D65 (10°) was used instead of the CIE illuminant C (2°). Puncture strength Puncture strength is measured according to ASTM Designation D3763-02. From penetration impact-type tests, this method produces data of load versus displacement. The maximum load is calculated for each laminate. 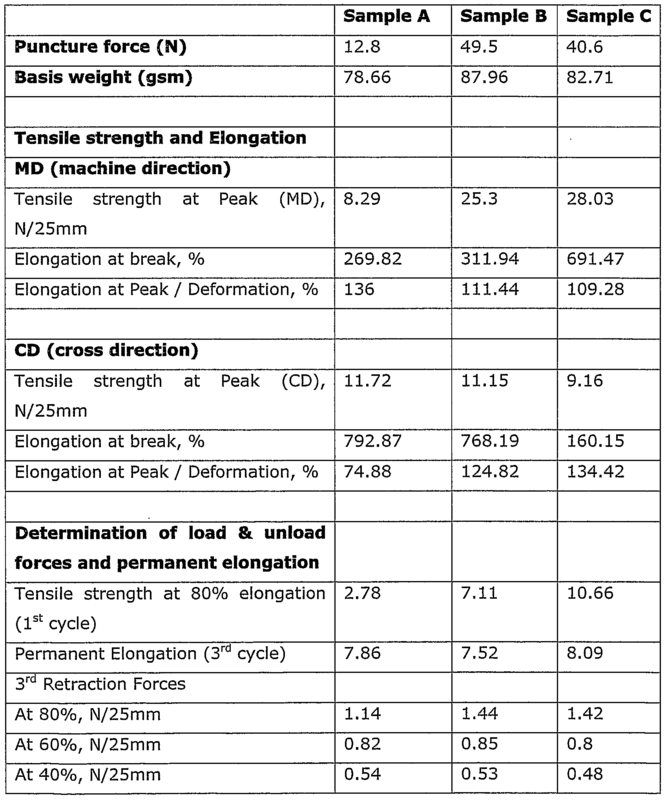 Tensile strength (Reference: ASTM D 882) The method measures tensile strength and elongation of difference elastic materials. The tensile strength and elongation of a well-defined test piece is tested by means of a tensile tester. Sample preparation: Test samples are cut from the entire width of the material. The width of the sample shall be 25.4mm and the length at least 50mm longer than the clamp distance if possible. It is of importance that the edges of the sample are even and without break notches. The samples are conditioned for at least 4h in 50%RH ± 5% RH and 23°C ± 20C before testing. The slope was measured between 0,5 cm"1 and 1.5 cm"1 and -0,5 cm"1 and -1,5 cm"1. The slope was measured between 0.5 cm"1 and 2.5 cm"1 and -0,5 cm"1 and -2,5 cm"1. Maximum shear angle: φ=±8° . Sample effective dimension: 20 cm width and 2.5 cm length; Tensile deformation is applied to the length direction. Elongation sens 50 mm/10V. The Formability (F) according to Kawabata is obtained from the formula: F=B-EMT. D=116+25- log(B-G/W), wherein W is the basis weight of the sample. The inner film layer contained 4.9% by weight filler in the form OfTiO2. The open area of the film layer was 13%. The elasticity of three different samples (A, B and C) were measured according to the method given above and are shown in Table 1. Sample A is an elastic laminate according to WO03/047488 with 15gsm PP spunbond nonwoven on both sides of a 40gsm elastic film. The used spunbond nonwoven has an elongation at maximum load of 60%, which is less than the elasticity of the laminate. The low puncture resistance of this material means that it falls outside the scope of the present invention. Sample B is an elastic laminate with 25gsm PP/PE spunbond nonwoven on both sides of a 36gsm elastic film. Kawabata tests Four different samples were measured in a Kawabata test with respect to Bending rigidity (B), Shear stiffness (G) and Tensile strain (EMT). From these measured values the Softness (S), Formability (F) and Drapability (D) were calculated. Sample laminate (SL): an elastomeric laminate according to the invention comprising an inner apertured three-layer elastomeric film of PE-SEBS-PE, basis weight 36 g/m2 and two outer layers of spunbond material, PP (polypropylene), each having a basis weight of 22 g/m2. The laminate is produced by a modified version of the method disclosed in WO 03/04788 and which is described above, wherein one spunbond layer is applied to the film in a tacky state and will thus bond to the film layer, while the other spunbond layer is adhesively laminated to the film layer using for example a pressure sensitive hot melt adhesive (glue amount 3 g/m2). The laminate is incrementally stretched, at which the non-elastic spunbond layers are stretched to a point below the elongation at maximum load to retain some strength in the spunbond layers. The elasticity of the laminate after stretching is close to the elasticity of the elastomeric film layer. Ref. 1 : Cotton-knitted goods, so called jersey with elastomeric threads. Ref. 2: Outer coversheet of Tena Discreet incontinence pant (odour control, size medium) produced by SCA Hygiene Products AB. The outer coversheet comprises two layers of nonwoven with parallel elastic threads there between, which wrinkle the material. Ref. 3: Outer coversheet material of Poϊse normal super incontinence pant produced by Kimberly-Clark. The outer coversheet comprises two layers of nonwoven with parallel elastic threads there between which wrinkle the material. A climate conditioning of the materials were performed at 2O0C and 65% RH for 48 hours. For the pant products, the absorbent core was removed and the outer coversheet was stretched over a knitwear measuring device for 24 hours and was then allowed to relax in the same climate during 24 hours. The sizes of the samples were 10 x 10 cm. Drapability (D) : a higher value indicates a stiffer material. Formability (F): a higher value indicates that the material is less formable. The test laminate according to the invention has a Softness (S) and a Formability (F) according to Kawabata which is close to cotton-knitted goods (Ref. 1). Also the Drapability (D) according to Kawabata is closer to the cotton-knitted reference material than the other two tested materials. Thus the use of the elastomeric laminate provides a pant article having a cloth-like feeling close to a cotton material. The pant will also have an excellent comfort and fit to the wearer's body. By using the elastomeric laminate only in those parts of the pant in which the properties of the material is best utilized, a very economic utilization of the material is accomplished. 1. Pant-type underwear article (10), comprising front (12), back (14), crotch (16) and waist (18) regions, said article (10) having a longitudinal (y) and a transverse direction (x), at least part of the article (10) comprising an elastic laminate (20) composed of first (22) and second (24) layers of fibrous material and an elastic film layer (26) located between said first and second fibrous layers (22; 24), characterized in that said elastic laminate (20) has a puncture resistance of at least 15N. 2. The article as claimed in claim 1, characterized i n that the elastic laminate (20) has a puncture resistance of at least 2ON, more preferably at least 3ON. 3. The article as claimed in any of the preceding claims, characterized in that at least the front region (12) of the article comprises the elastic laminate (20). 4. The article as claimed in any of the preceding claims, characterized in that both the front and back regions (12; 14) of the article comprise the elastic laminate (20). 5. The article as claimed in any of the preceding claims, characterized i n that a substantial part of the crotch region (16) of the article is free from said elastic laminate. 6. The article as claimed in any of the preceding claims, characterized in that the waist region (18) of the article is free from said elastic laminate. 7. The article as claimed in any of claims 1-4, characterized in that the entire article (10) comprises the elastic laminate (20). 8. The article as claimed in any of the preceding claims, characterized i n that said elastic film layer (26) is breathable. 9. The article as claimed in claim 8, characterized i n that said elastic laminate (20) has a Water Vapour Transmission Rate according to ASTM E96-00 Procedure D of at least 1500 g/m224h, preferably at least 3000 g/m224h. 10. The article as claimed in any of the preceding claims, characterized i n that said elastic laminate (20) has an elasticity in the transverse direction of the article of at least 30%, preferably at least 50%, more preferably 70%, when measured according to the elasticity test specified in the description. 11. The article as claimed in any of the preceding claims, characterized i n that at least one of the layers of fibrous material (22, 24) has an elongation at maximum load greater than the elasticity of the elastic laminate (20). 12. The article as claimed in any of the preceding claims, characterized i n that both layers of fibrous material (22, 24) have an elongation at maximum load greater than the elasticity of the elastic laminate (20). 13. The article as claimed in any of the preceding claims, characterized i n that the layers of fibrous material (22, 24) have an elongation at maximum load of at least 10%, preferably at least 20% greater than the elasticity of the elastic laminate (20). 14. The article as claimed in any of the preceding claims, characterized i n that the first and/or the second layers of fibrous material (22, 24) comprise a mixture of polypropylene and polyethylene polymers. 15. The article as claimed in any of the preceding claims, c h a r a c t e r i z e d i n that said elastic laminate (20) comprises first and second fibrous layers (22, 24) of spunbond material, each having a basis weight of between 10 and 35 g/m2, preferably between 12 and 30 g/m2, more preferably between 15 and 25 g/m2and a breathable elastic film layer (26) having a basis weight between 20 and 100 g/m2, preferably between 20 and 60 g/m2, said elastic laminate (20) having a Water Vapour Transmission Rate according to ASTM E96-00 Procedure D of at least 1500 g/m2 24h, preferably at least 3000 g/m2 24h. MX2007009158A MX2007009158A (en) 2005-03-02 2005-03-02 Underwear article comprising an elastic laminate. CH694447A5 (en) * 1999-07-01 2005-01-31 I M E C Medizinische Textilien Pants, and methods for making same.